It is time to decide which of Universal Orlando Resort’s soon-to-be eight on-site hotels is best for you and your party: Loews Portofino Bay Hotel, Hard Rock Hotel, Loews Royal Pacific Resort, Loews Sapphire Falls Resort, Universal’s Cabana Bay Beach Resort, Universal’s Aventura Hotel, and the upcoming multi-property Universal’s Endless Summer Resort (which will begin its multi-phase opening in summer 2019). Let’s start with what is the same about all eight venues. What do all of Universal’s on-site hotels have in common? Universal divides its eight on-site resorts into four different categories: premier (Portofino Bay Hotel, Hard Rock Hotel, and Royal Pacific Resort), preferred (Sapphire Falls Resort), prime value (Cabana Bay Beach Resort and Aventura Hotel), and value (Endless Summer Resort’s two constituent hotels, Surfside Inn and Suites and Dockside Inn and Suites). NOTE: since Endless Summer Resort is still so newly-announced – and still so far away from actually opening – Universal has yet to officially confirm that all of the above perks will make their way to the new plot of land down the street that Endless Summer will sit on. However, given the “universality” of these benefits, we’re fairly confident that they will, indeed, show up at the new value hotel complex. What do the premiere and preferred on-site hotels have in common (and not)? Okay – now it’s time to get down to brass tacks. 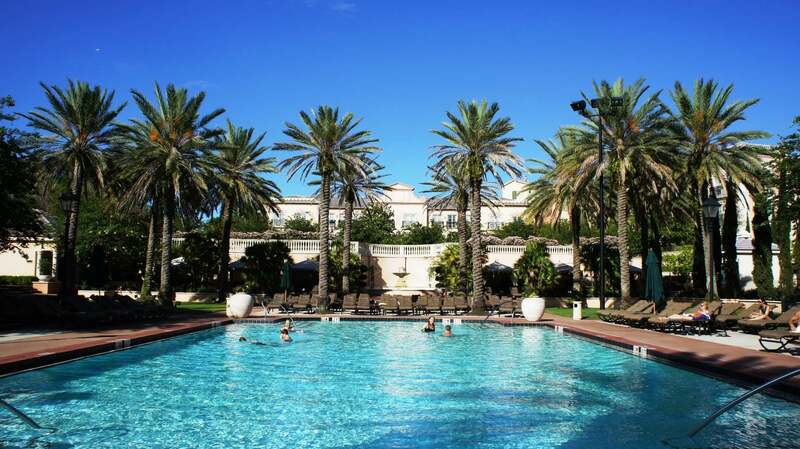 Each of the four top venues at Universal Orlando (which, once again, are Portofino Bay Hotel, Hard Rock Hotel, Royal Pacific Resort, and Sapphire Falls Resort) is an AAA Four-Diamond resort property, meaning – regardless of which you choose – you’ll be staying at a higher-end hotel with detailed theming and upscale amenities, such as large pool areas, fine-dining restaurants, supervised kids’ activities, and business centers. Despite all these commonalities, however, there are still some differences to be found among them, and it’s very important to keep these in mind, as well. The premier resorts offer two extra benefits that their five on-site brethren don’t: priority seating at Universal Orlando’s various restaurants and, more notably, free Unlimited Express Passes for each hotel guest. Yes, this means that Portofino Bay, Hard Rock, and Royal Pacific are considerably more expensive than the others, but it also means that, depending upon your group size and dates of your stay, you can save money as compared to buying Express for each member of your party separately. What do the prime value and value on-site hotels have in common (and not)? So what, then, differentiates a prime value property from just a value one? To put it in a word, distance – not only from the theme parks, but also from Volcano Bay. Let us explain. First and foremost, Endless Summer is located on a separate chunk of land from the rest of Universal Orlando. While it’s still technically an on-site resort (meaning you get Universal’s trademark theming and array of benefits, such as Early Park Admission), and while the bus ride to CityWalk lasts just as long as Cabana Bay’s, this new value hotel complex won’t allow you to (easily) stroll to the parks on foot. And that leads us directly to the next point: in order to compensate for Cabana and Aventura’s lack of water-taxi access to the theme parks, they feature a private walkway directly to Volcano Bay (everyone else, including all the other guests at all the other on-site hotels, have to hop on a shuttle, which is a more involved process). This is, of course, something that Endless Summer can’t offer, so its classification – and pricing – reflects that. There are four primary characteristics that differentiate the eight hotels from each other: theming, number of rooms, size of the rooms, and price. Ultimately, these four elements combine to make each resort a good match for particular groups. Let’s take a closer look. Theming: a fun, coastal, laid-back beach vibe – which the next-door lake will only accentuate. Number of rooms: 2,800 combined (750 at Surfside Inn and Suites, 2,050 at Dockside Inn and Suites) – the largest overall of the eight on-site hotels. Room size: unknown as of now. Best match: Endless Summer is a best match for any party traveling on a tight budget. Keep in mind: Endless Summer does not offer either complimentary Express Pass access or water-taxi service. 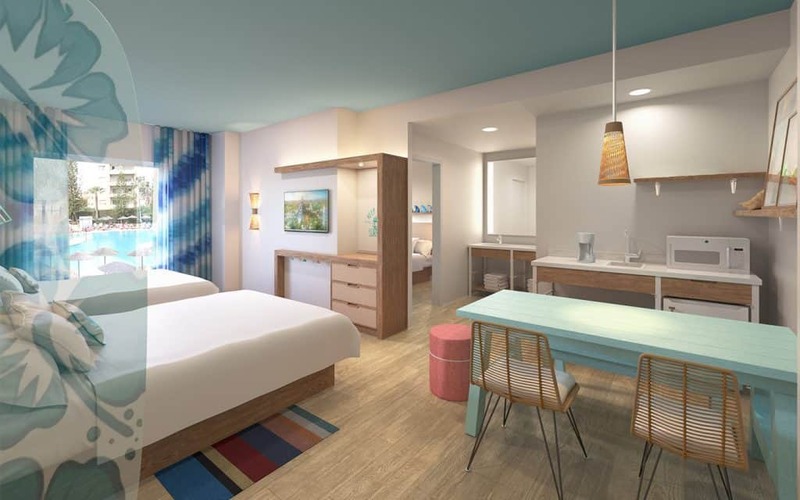 Note: Surfside Inn and Suites opens in summer 2019, while Dockside Inn and Suites follows in phases throughout 2020. Theming: a sleek, modern hotel that is light on theming but still heavy with style. Number of rooms: 600 – the smallest of the eight on-site hotels. Room size: standard rooms are 314 square feet. Price: standard rooms range between $144 and $244 per night. Best match: Aventura is a best match for those who are less concerned with theming and more concerned with a 17-story rooftop bar or the iPads that come equipped with each room. 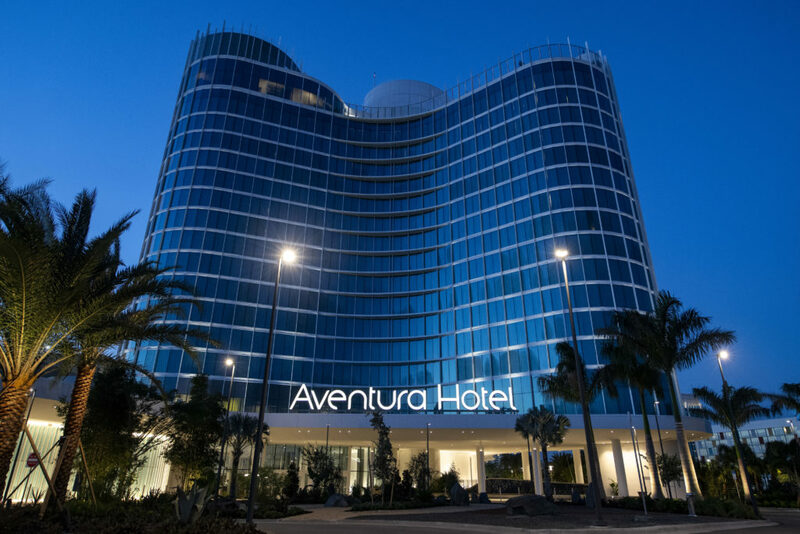 Keep in mind: Aventura does not offer either complimentary Express Pass access or water-taxi service. Theming: splash back to the 1950s and ’60s, a vintage look pulled right from the blockbuster TV show Mad Men (with a dash of Old Florida). Number of rooms: 2,200 – the largest of the individual on-site hotels. Room size: standard rooms are 300 square feet. 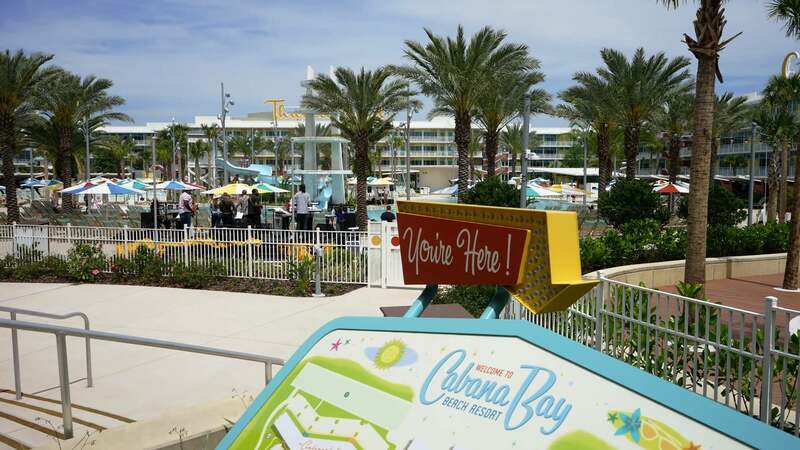 Best match: Cabana Bay is a best match for any party traveling on a tight budget but that still wants to be close to the action (especially Volcano Bay). Keep in mind: Cabana does not offer either complimentary Express Pass access or water-taxi service. Theming: a paradise where shoes are optional, blue waterfalls cascade across lush grounds, and the invitation to cool relaxation is everywhere. Number of rooms: 1,000 – tied for the third-largest of the eight on-site hotels. Room size: standard rooms are 321 square feet. Price: standard rooms range between $199 and $314 per night. 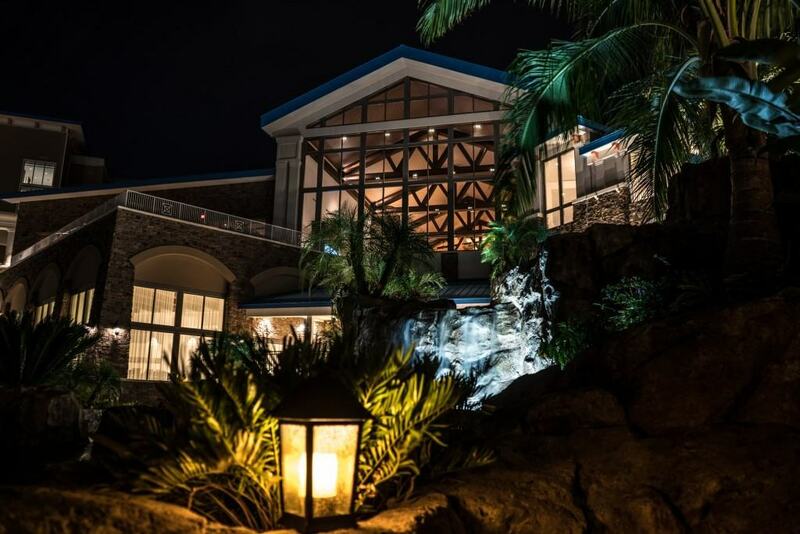 Best match: Sapphire Falls is great for meeting and convention attendees. In addition, it may be the perfect fit for a family looking for additional accommodations over the (prime) value hotels but isn’t interested in having Express Passes. Keep in mind: Sapphire does not offer complimentary Express Pass access. Theming: the South Seas. It has a tropical, festive feel to it, with a mix of relaxation and excitement. 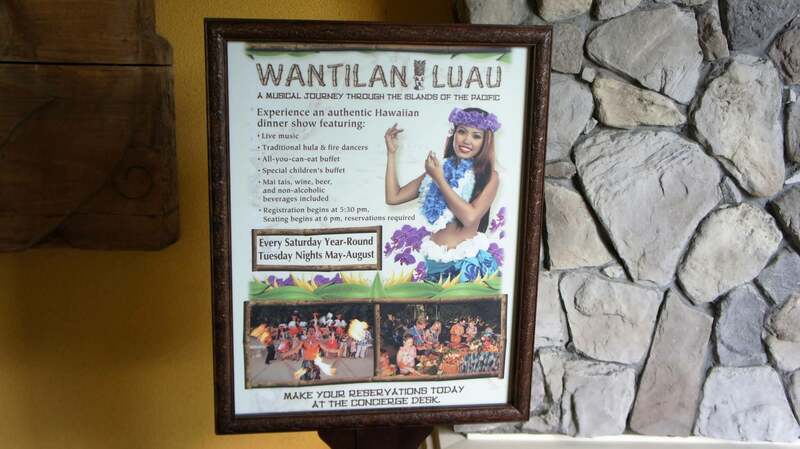 If you are someone who really enjoys immersive theming, you should be pleased with Royal Pacific. Room size: standard rooms are 335 square feet. Price: standard rooms range between $274 and $479 per night. Best match: Royal Pacific is a best match for families with young children. And, as Universal Orlando’s most economical hotel that still offers complimentary Express, it is the best bet for travelers during a peak season on a budget. Keep in mind: Royal Pacific is the closest of the three hotels to Islands of Adventure – it usually takes less time to walk from this resort to the park’s turnstiles than it does to take the water taxi. In general, Royal Pacific is the third of the eight on-site hotels to sell out. While all Universal on-site properties receive positive reviews, we see the most about this one. It is also the venue that has treated us the best in our hundreds of stays. OI tip: Royal Pacific has a number of rooms that look out directly toward Islands of Adventure, giving you a clear view of Hulk, Hogwarts Castle, and more. If you’d like one of these rooms, be sure to request a “park view” room on the seventh floor of Tower 2, the sixth floor of Tower 3, or the seventh floor of Tower 3 (club level). Theming: California mansion, like the one featured on the front of the Eagles album Hotel California. It is true that this resort is fairly striking from the outside, and the pool area is a pleasure. When you move inside, however, the story changes: the clean white walls and modern styling come off as rather boring. 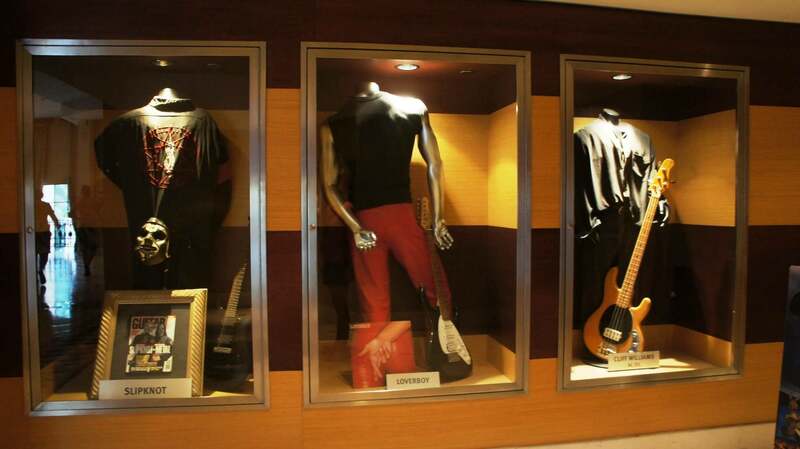 If you are not looking at a piece of Hard Rock’s collector memorabilia, you will probably feel like you are just in another hotel. Number of rooms: 650 – the second-smallest of the eight on-site hotels. Room size: standard rooms are 375 square feet, or 10 percent larger than Royal Pacific. Price: standard rooms range between $314 and $549 per night. Best match: Hard Rock is about image and attitude, and who in the family does that remind you of? Yes, Hard Rock is a big hit for families with teens. Younger couples also find their way here, searching for the free spirit of the rock ‘n roller. Despite what we noted in the theming section about the interior spaces, Hard Rock does have an energetic atmosphere – but it comes from the guests hanging out and looking for a good time. Keep in mind: in case you are at all concerned that Hard Rock may be a little too “hard” for your impressionable kids, you need not worry – it is a very family-friendly property. Because of its smaller size and popularity with teens (which, coincidentally, is a huge demographic for the Universal Orlando theme parks), Hard Rock is almost always the first hotel to sell out. If you want to stay here, book your room now! Can’t you just feel yourself sinking into the warm water for a swim…? Theming: modeled after its namesake, the famous fishing village in the Italian Riviera. As Universal Orlando’s flagship hotel property, Portofino Bay features the most impressive theming of the eight on-site hotels (although Royal Pacific is not too far behind). The property is also somewhat offset from CityWalk and the three parks, further adding to its immersive qualities. Number of rooms: 750. It is worth noting that while Portofino Bay has fewer rooms than Royal Pacific, the physical layout of the hotel is more expansive; it is not unusual for guests to feel a bit lost the first time they walk around. However, this is not a frustrating sensation – in the case of Portofino Bay, it only helps to elevate the theming and the sense of having been swept away to an exotic Italian retreat. Room size: standard rooms are 450 square feet. That is 25 percent larger than Royal Pacific and about 15 percent larger than Hard Rock. Price: Standard rooms range between $329 and $544 per night. 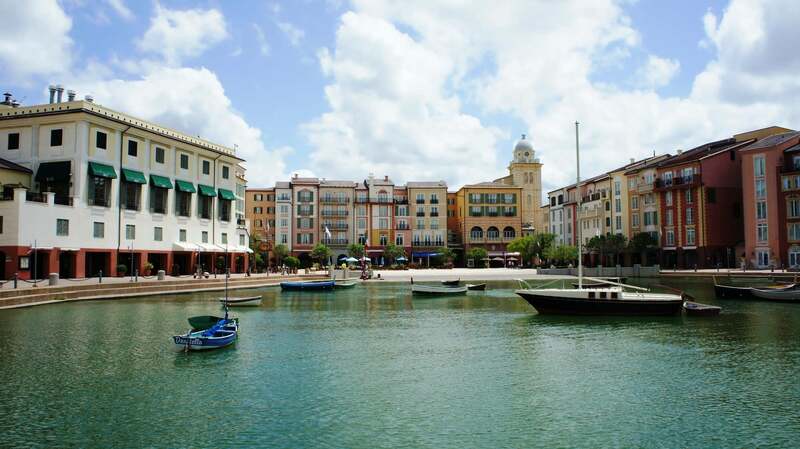 Best match: Portofino Bay, as already mentioned, is the flagship resort at Universal Orlando. Not only is it the most impressive in terms of theming, it also features the widest selection of amenities. For example, it has three pool areas – Hard Rock, Royal Pacific, and Sapphire Falls only have one. It also has more restaurants and shops than the other seven hotels. Perhaps more importantly, Portofino is tied (with Sapphire) for the largest selection of room types, including five separate suite categories. All that we have described makes Portofino Bay the obvious choice for older couples or parties in the mood for romance. Keep in mind: Portofino Bay may be designed for guests who are looking for a more upscale experience than any of the other properties, but it’s worth mentioning that this venue is also a very good match for families who want a break from the craziness of the parks. Royal Pacific and Sapphire Falls have a lot more rooms and only one pool each, so they can be hectic. Hard Rock is, well, Hard Rock. And Cabana Bay, with its staggering room count, is always crawling with people. But Portofino, with its expansive property layout, larger number of amenities, and secluded location away from the theme parks, offers plenty of peace and quiet. Also, Universal Orlando’s full-service spa is at Portofino Bay! Many guests are delighted to find out that by staying at one of the on-site hotels, they have complimentary access to the amenities at all the others. This is particularly useful to know if your hotel of choice is sold out. Most common scenario: a family with teens wants to stay at Hard Rock, but there are no more rooms available. Well, they will most likely be able to stay at Royal Pacific and save a little bit of money, and they can still hang out at Hard Rock’s pool (be sure to bring your room keys!). Even if you are not staying on-site at Universal Orlando, you can visit the hotels, too! Theme park veterans know this already, but just in case you are a first-timer, we will let you in on a little secret: anyone can visit the Universal Orlando on-site hotels. (The same goes for all of Walt Disney World Resort’s on-site hotels, too, just for the record.) Now, you do not necessarily have access to all the amenities – don’t plan on bringing your swimming trunks – but you can still visit, check out the theming, and grab a meal. We highly recommend that anyone visiting Universal for more than two days jump on the water taxis (or shuttle) and tour the resorts. That brings us to one important reminder: all on-site properties charge for parking. And they charge more to day-guests than Universal’s main parking garage, so don’t think you can skip the parking fee by grabbing a spot at a hotel like you can at Disney World. If you are going to stay on-site at Universal Orlando Resort, please be aware that the hotels charge for many things guests usually assume are included with the room, such as parking. We should also mention that none of Universal’s properties operate their own shuttles, whether paid or complimentary, to Orlando International Airport (unless you’re a vacation package holder, that is). What about the hotels’ cancellation policy? Since all eight on-site hotels are operated by Loews, they all feature the same cancellation policy: if you cancel your reservation six or more days in advance, you will receive a full refund. If it’s anything fewer than five days beforehand, however, you will be charged one night’s room rate, plus tax. Do you have a question about staying at Universal’s on-site hotels? Please let us know by posting in our Universal Community Facebook group.